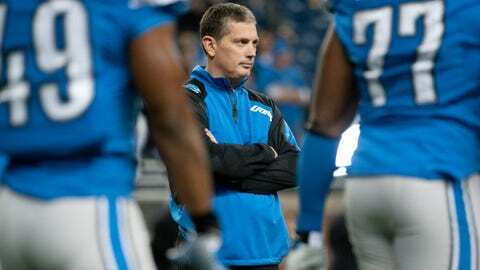 Coach Jim Schwartz could be down to his final two games if the Lions don't find a way to win their first division title in 20 years and get into the playoffs. Bench the quarterback, fire the coordinators and kill the head coach. The Lions have now fallen into third place behind the Bears and Packers with two games remaining. Football rage has hit Detroit yet again following the Lions’ crushing 18-16 loss Monday night to the Baltimore Ravens on a last-minute, 61-yard field goal. "We’re 7-7 and it feels like we’re 0-14," coach Jim Schwartz said Tuesday during his weekly news conference. "That’s just life in the NFL. That’s what you go through." Schwartz paused, then admitted he had stolen the quote from Baltimore quarterback Joe Flacco, who said something similar a year ago about this time, when the Ravens looked down and out before getting hot in the playoffs and winning the Super Bowl. "That’s the way this business is," Schwartz said. "You live and die every single week." Lately, the Lions have been dying. They’ve fallen into third place, a game behind the division-leading Chicago Bears in the NFC North, with two games remaining. Schwartz, in danger of missing the playoffs for the fourth time in his five seasons as coach, is under fire, as is his quarterback, Matthew Stafford. 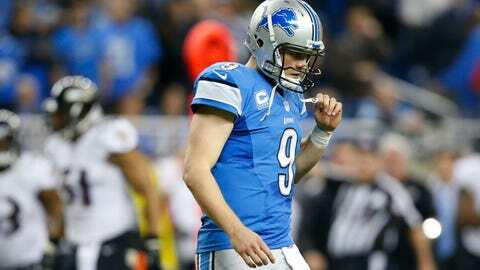 "He feels a tremendous responsibility to help this team win," Schwartz said of Stafford. "We’ve been in a tough stretch. Knowing Matt, knowing where he’s been, things he’s done, it doesn’t affect his confidence. "He has the respect of his teammates. He has the respect of the coaching staff." In the last five games, though, Stafford has been on a downward cycle, throwing more interceptions (10) than touchdown passes (nine). He completed 18 of 34 passes for 235 yards, one touchdown and three interceptions against the Ravens while finishing with a 48.0 quarterback rating, his third-worst individual rating for any game in the last four seasons. Stafford is ranked No. 20 in QB rating for the season (85.8) and is tied for third for the most interceptions thrown (17). Nevertheless, Schwartz made it clear that there will be no quarterback change for Sunday’s game against the New York Giants, even though the Lions have a reliable backup in Shaun Hill. Schwartz put the onus on the entire team to help pick up Stafford. "I haven’t considered making a change," Schwartz said. "Matt’s our quarterback. He’s going to remain our quarterback and he’s going to play well for us. "We haven’t played well enough around him at times. It’s not just about one person. We’ll get him back." Stafford signed a three-year, $53 million extension during theoff-season — $41.5 million of it guaranteed — and is under contract through 2017. Schwartz, on the other hand, could be down to his final two games if the Lions don’t find a way to win their first division title in 20 years and get into the playoffs. Not only do they need to win both of their games, including at Minnesota on Dec. 29, but they also need Chicago (8-6) and Green Bay (7-6-1) to lose at least one game each. Schwartz was pressed Tuesday about his job security again after fielding similar questions right after the loss the previous night. "I don’t think it does any good for me or for our team to continue commenting on that," Schwartz said. "I think I’ll just respectfully decline to keep going in the same place with those. "Our focus is on the Giants. We can control our preparation. We can control our performance. That’s what we need to concentrate on." Schwartz did concede that his uncertain job status potentially could become a distraction for the players, but he’s hoping to keep that from happening. "We’re all professionals," Schwartz said. "I don’t think it’s anybody’s job to worry about anything other than getting ready for the game. "We’re one game down with two to play. There’s a lot of things that can happen over these next two weeks." For the Lions, most of those things aren’t good. Schwartz didn’t rule out that cornerbacks Chris Houston (toe) and Darius Slay (knee) could return Sunday, but he added that Houston "is probably a little bit ahead." "There’s a chance for both of them," Schwartz said. "We’ll see how they both respond this week." "Sam didn’t warm up real well for kickoffs," Schwartz said. "He started feeling a little bit tight in his groin. He does punting and kickoffs and they’re two different strokes with his legs. "David was kicking well in pre-game warm-ups so we opted to go with David. It allowed Sam just to concentrate on punting in the game. He didn’t have to push it."